CUP O FLORA is a stylish self-watering pot that makes growing plants easy. With its clear water reservoir, CUP O FLORA provides a set-and-forget solution for busy plant lovers. A large variety of plants thrive on the simple and effective self-absorption mechanism. Much thought has been given to the look and functionality of the product. The result is a clear pot made of strong borosilicate glass using a simple refill system. CUP O FLORA - Clearly Different. 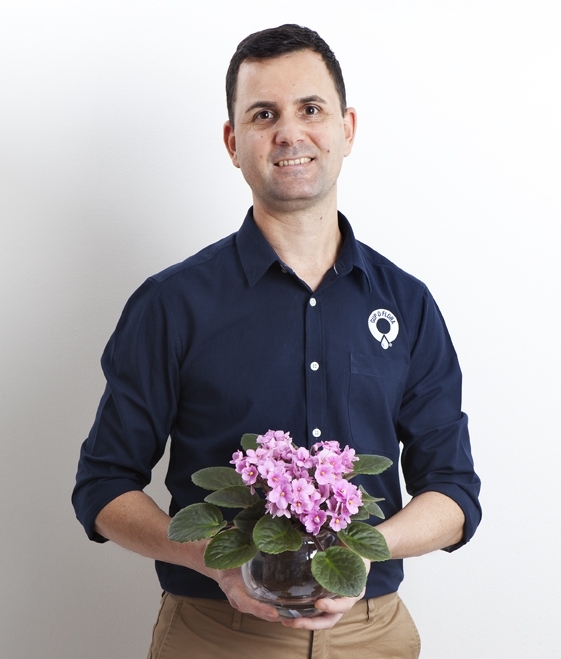 For most of his life Odi (Oded) Reuveni has been 'rescuing' plants from friends and nurseries, and bringing them back to life. Odi's challenge was to come up with an intuitive and clean alternative to conventional pots that would make plant care easy. Odi used his training as a researcher to explore the market and came across a small plastic pot while travelling in Brazil. He then spent six months improving the design and quality of the product. The result is CUP O FLORA, a beautiful yet simple plant pot allowing busy plant lovers to grow their favourite leaf and flower anywhere. Odi's passion for plants and soil was inspired by his father Mordechai, who for the past fifty years has designed and built numerous gardens. Born in the semi-arid town of Kalgoorlie, Western Australia, Mordechai has been known for transforming barren landscapes into beautiful gardens. Now in his eighties, Mordechai continues to maintain the gardens he created and keep the environment clean. Over fifty years of garden design and construction - Mordechai in his element.